Almost every band has a similar story—guys that knew each other since grade school decided they loved music and wanted to start a band. Sometimes it’s three separate bands got together to cherry-pick a couple guys from each to form a much better group. That’s about it though—not a ton of variation. Not today’s band. They each left the daily grind to get something going. It’s similar to the Village People only with a plumber, a sandwich maker, a pet store clerk, and Lowe’s stock boy. Forming in 2006, the band didn’t have to wait long to get a record deal. In 2007 they played a music festival in Canada and got noticed by Relentless Records, which is distributed by Sony Music. Since the label was based out of the U.K., the band decided to move across the pond to see if their music would catch on over there. At the time however, they needed to be careful about travel because their lead guitarist was only 16 years old. His parents ended up signing over parental rights to the band, as it became too much of a hassle to deal with the constant paperwork. In 2008 they would perform on a U.K. late night television show with acts like Coldplay and John Mellencamp in the audience. Reaction was incredibly positive so the label decided to move forward with an album release. 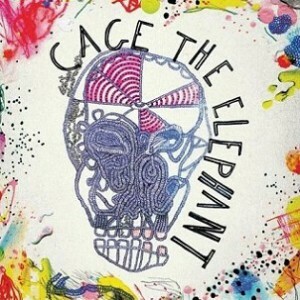 There are various stories on how the name came about, but Cage The Elephant was on their way. We’re listening to that very album today—their eponymous debut which came out in June of 2008. The label decided to essentially test the album in the U.K. market first before committing to a worldwide release. After a good showing, the album made its way to the U.S. in April of 2009. The first couple singles failed to make any noise in the states and it seemed the band might have to keep grinding in the U.K. However the third single ‘Ain’t No Rest For The Wicked’ made it all the way up to #3 on the alt songs chart and the album would start to get some real airplay. They’d come back to the states, play major festivals like Lollapalooza in Chicago and start to really make a name for themselves. Part of the following they got was because of their high-energy live performances, a staple of the band. I’m not exactly sure how, but I found this album the day it came out. It’s something so different—a blend of styles I’m not sure I’ve ever heard before. It has a feel like they were playing in your neighbor’s garage but somehow polished that alt rock/punk rock sound. I have also had the pleasure of seeing them play live twice, and they do certainly bring a performance that you don’t forget. Since most of their music is up-tempo and a bit in-your-face, the crowd tends to feed off that energy and get going with the band. This isn’t a high-selling album, which is incredibly surprising to me. It might be the best album ever recorded to only sell 500,000 worldwide. You should definitely pick this one up today if you’re into rock music. It’s like indie-folk songwriting meets a super-laid-back, yet energetic punk-rock band that was influenced by 90’s grunge. If that sentence doesn’t make sense—good, it shouldn’t. That sort of sums up their eclectic sound. Take those five singles earmarked for the vending machine and put them toward this album instead, it’s worth it.